This information is provided, courtesy of Family Tree Magazine (Nov. 2016) .Each of the Mac and Windows genealogy software packages listed below is available for free, or as a trial version that is limited in some way (family size restrictions, expiration after 30 days, or other "crippled" features). Links to download each software program are provided , as well as links to software reviews. Play with several different programs for free to find a favorite. NOTE: Pricing, features and links current in March, 2017 but may change.at any time. GRAMPS (Genealogical Research and Analysis Management Programming System)​ is free genealogy software for your desktop PC or Apple computer, offering a professional genealogy program & an online wiki page open to everyone. It is a community project, created, developed and governed by genealogists. It helps you track your family tree by allowing you to store, edit, and research genealogical data. 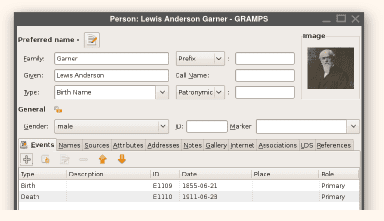 Gramps provides all of the common capabilities of other commercial ($$$) genealogical programs like Family Tree Maker, Legacy or RootsMagic, but also provides the additional ability to integrate and input any bits and pieces of information directly into Gramps and rearrange and manipulate data events in any order or sequence to assist with analysis and correlation and help researchers identify and overcome relationship gaps. Absolutely Free - this software is called "donarware" and the ongoing costs of development and enhancements are provided by volunteer efforts and contributions of dedicated users. ​How do I get GRAMPS? How does GRAMPS Compare to Commercial Programs? GRAMPS genealogy software has nearly all of the features and capabilities of commercial genealogy programs, including entry and tracking of people, families and relationships. It can hold media (pictures), attach sources and citations, create and print charts & reports, import and export GED file types and Web Family Tree (WFT) export to allow you to share your family tree online. GRAMPS falls a little short if you want an "App" for your iOS or Android smart phone or if you want slick web integration (such as to Ancestry or FamilySearch sites). ​For a review of commercial genealogy software, see this article: 10 Best Commercial ($$$) Genealogy Programs.